Inside the waistband holsters are commonly referred to as IWB holsters. They are designed to ride inside the waistband, mounted to a belt using a metal clip, leather snap straps, kydex clips, or even velcro. Depending on the configuration, IWB holsters can be worn on the strong side, cross-draw, behind the hip, or towards the small of the back. IWB models are an effective concealed carry choice as they conceal the bulk of the weapon. Typically, the only portion of the weapon that rides above the belt line is the grip. While IWB holsters are offered for nearly every make and model pistol, they tend to be the most effective with small to mid-size weapons. Larger weapons such as a Beretta 92 or Glock 21 are difficult to cover due to their size and width. Cant or Ride - This option refers to the angle at which the holster sits or “rides” while on the belt or waist. Some IWB holsters offer a forward cant while others ride more vertically. Some high-end models offer an adjustable cant feature allowing you to set the cant angle yourself. Body shield - A body shield is the part of a holster that prevents the grip of the pistol from actually making direct contact with the shooter. This feature can help with comfort, as the rough edges of the weapon don't touch the user. 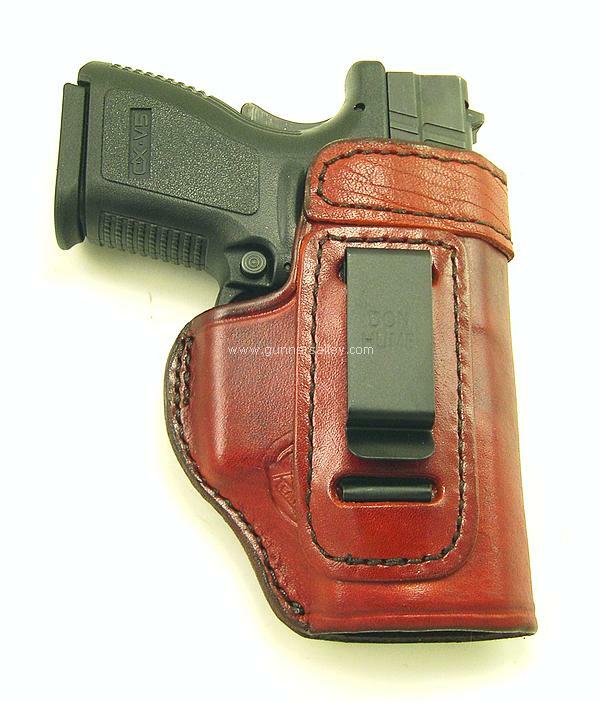 For many leather IWB holsters, the body shield is integrated into the design. Thumb break - A thumb break, also called a retention strap, is a leather snap strap that fits over the end of the weapon or the grip area to keep it in place within the holster. Most retention straps are single ply and feature some type of button, snap, or release mechanism that must be activated before the pistol can be drawn from the holster. Tension screw – Different from a thumb break, a tension screw is a device that allows the draw tension on the holster to be adjusted to the shooter's preferences. Tightening the screw will make it so that a weapon draw requires more force, while loosening the screw makes the weapon draw easier. Overall, IWB holsters provide a solid, stable platform for concealed carry as they allow the weapon to remain concealed within the waistband. Follow this link to view all the IWB holsters that we carry.